H.O.P.E. is today's beautiful plant and tomorrow's fruitful tree. 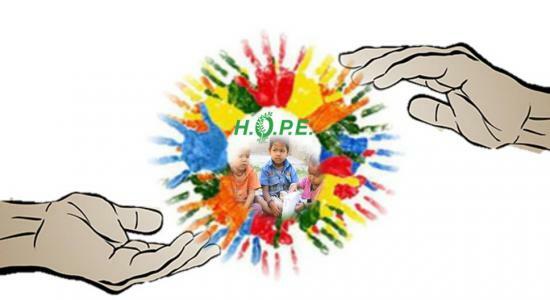 Envisaging a just and human society is the vision of H.O.P.E. Families make the building blocks of society and in the family the woman plays a pivotal role. In its endeavor to make a dent in the transformation of society its thrust is to empower women which we are doing in the areas of education, enabling, facilitating and intervening. 2015, H.O.P.E. 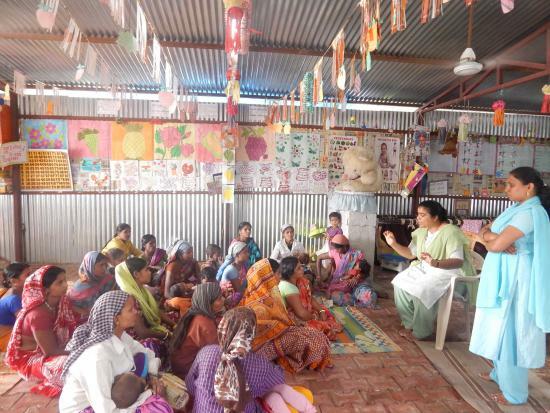 has enabled and guided 25 women self help groups with some 500 women. 5 new groups were started, one was closed. Domestic workers solidarity project was extended to more than 750 women in 15 different areas. 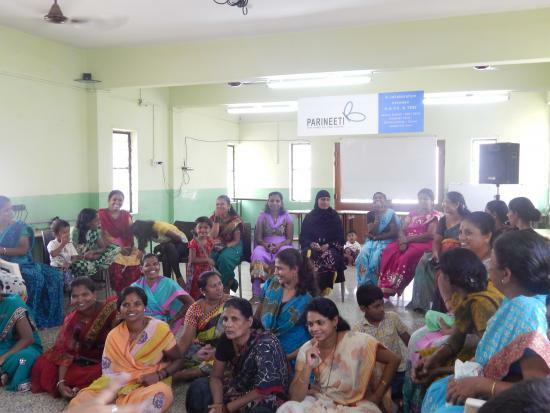 More than 180 women took part in H.O.P.E.’s various skill training courses. H.O.P.E. gave immediate help, legal assistance and counseling to 45 women in crisis situations. 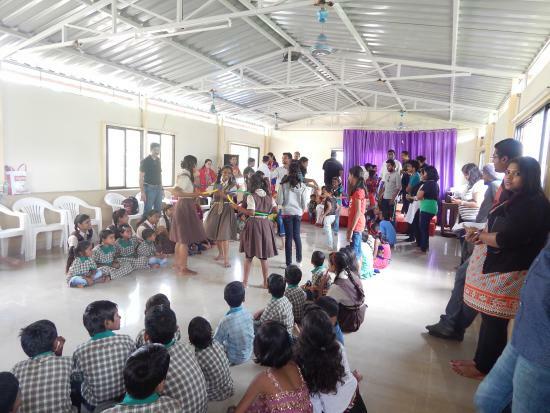 - 25 January, Scholastics from De Nobili College invited 100 children for a Children’s Melawa. What children loved best, was the location: The gathering took place in the middle of the woods. Quite an adventure! 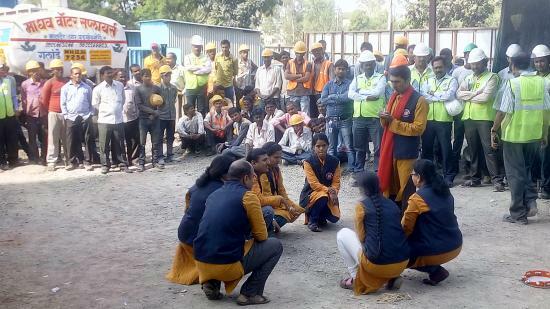 A construction site is not exactly the typical venue for Serva Seva Sang. 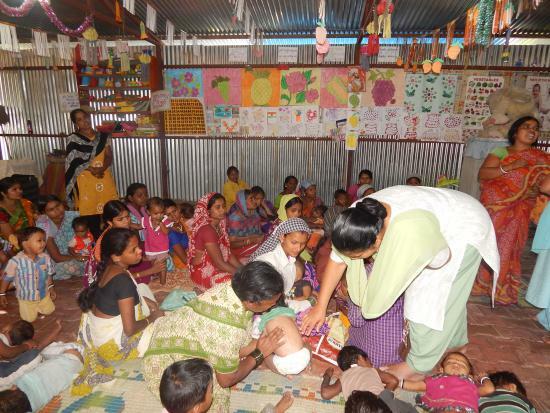 The NGO normally works for street children and HIV affected women and children. 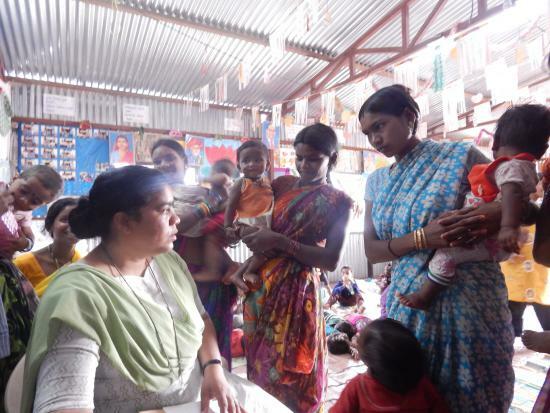 Yet here the eight social workers were, in the heart of Brahma Sun City, one of Vadgaon Sheri’s largest construction sites, speaking to some 40 men and women in security helmets, stout shoes and working clothes. What was going on? 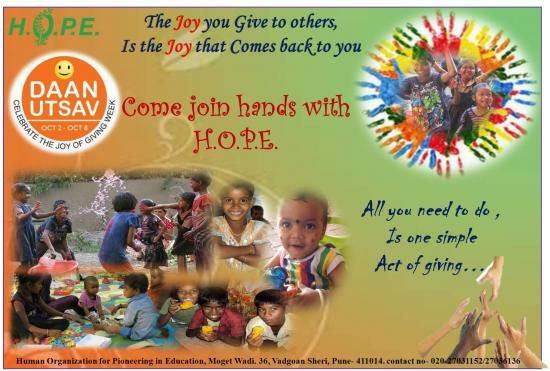 Dear All, The Joy of giving week is a “Festival of Giving”. It’s a time of sharing, helping, giving and celebrating the act of reaching out to the needy. A helping hand can change the world. 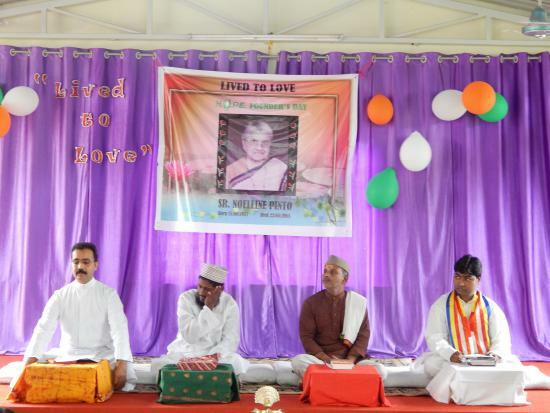 HOPE staff Celebrated Independence Day on 15th of August at HOPE center. Sr. Fatima Hosted the Flag and gave the beautiful speech about Independence /Freedom this followed by small get together. Neighborhood people too joined in the celebration to express their patriotism. 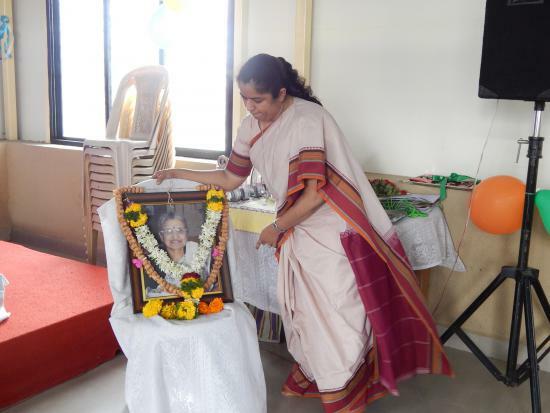 In memoriam of its founder, Sr. Noelline Pinto, H.O.P.E. 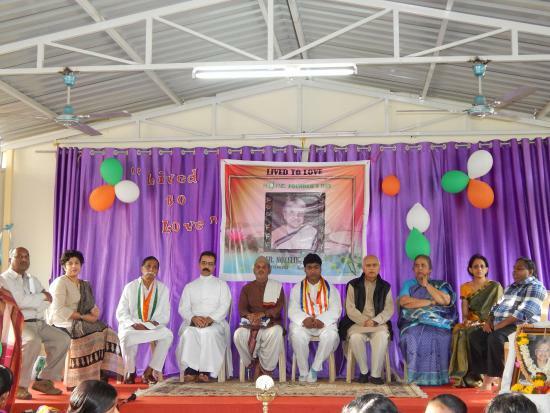 celebrated its first “Founder’s Day” on 14 August, 2015 – Sr. Noelline’s birthday. About 150 guests followed the invitation and came to H.O.P.E. Centre to spend an afternoon of celebration and commemoration. 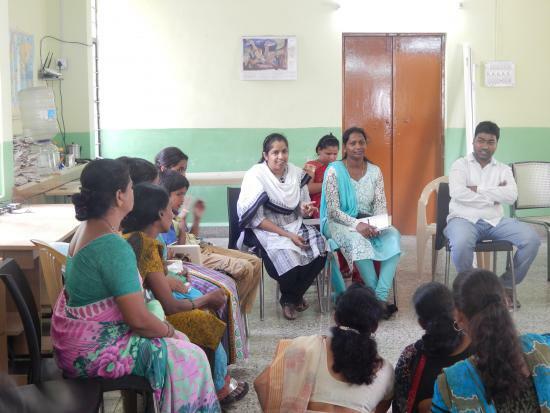 On 11th of July 2015 H.O.P.E organized a talk and interaction with Mothers of day care center. This talk was given by Sr. Sheila who is a nurse. She enlighten the Mother’s on ‘Mother care and safe Motherhood.’ These women are construction workers who are migrated and uneducated. After listening to their struggles and stories sister’s Sheila’s heart was filled with compassion and she promised to conduct health camp for them and will donate some medicine to them. 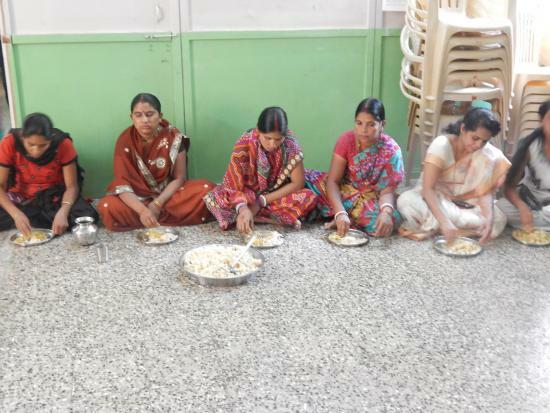 H.O.P.E organized two cooking training programs for the local women.On 15th of July 2015 at VadgaonSheri Goanthan 15 women from the near by locality attended the training. They were taught 3 Chinese recipes from 4 pm to 6 pm by Mrs. Nancy Fernandez.Second training was conducted on 22nd July 2015 at Manic Nagar, Yerwada Slums for which 22 women participated. 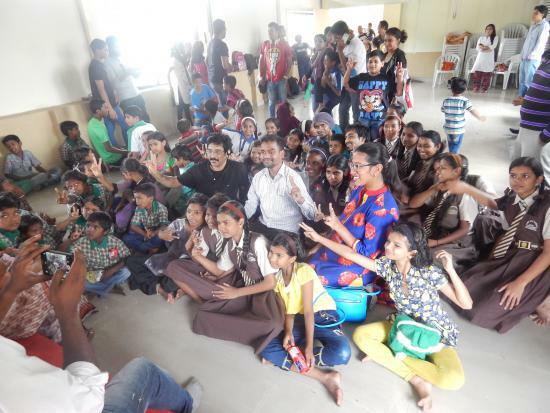 They were taught two non-veg recipes- Briyani and chicken tandoori. 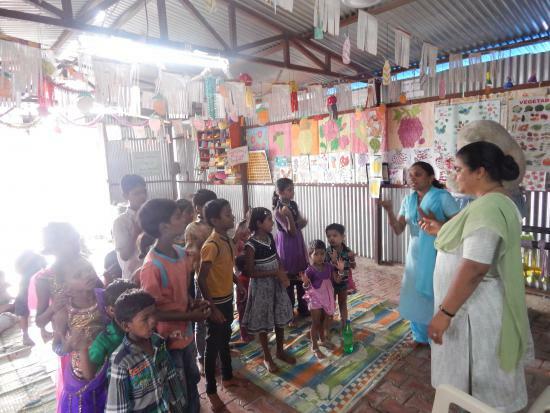 Tata Consultancy Services visited Children of the H.O.P.E with their volunteers. 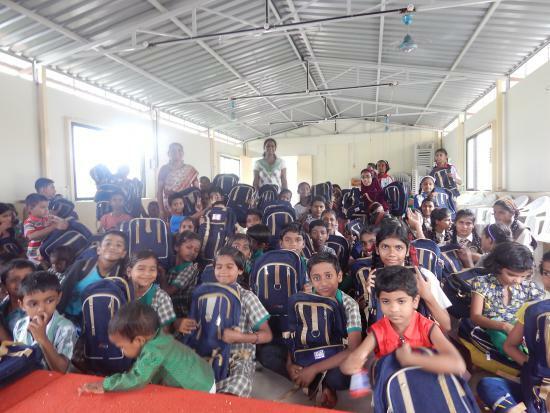 They distributed school kit consisted of school bag, books and pencil box for 100 children. They also donated provisions like poha, rice, oil, groundnuts and indoor games for the children of day care center. 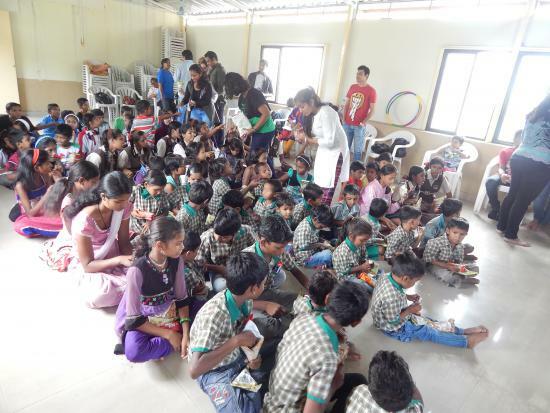 The volunteers from the company conducted some games and entertainment program for the children. Thanks to Tata Consultancy Services. 5th July 2015 H.O.P.E conducted Domestic workers Melawa at the center. The Melawa started with the lunch which brought the women together with joy and that followed the input session and information on how to form women’s federation by the social worker’s. 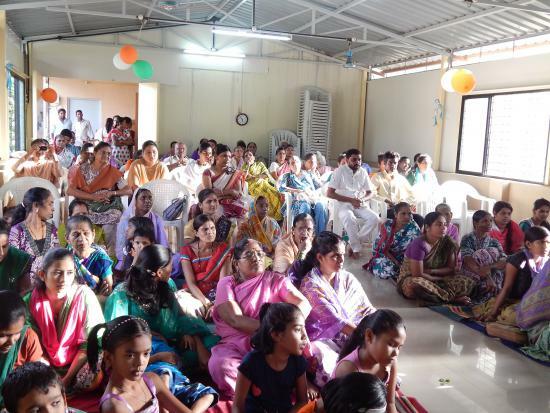 There were 60 women present for the Melava.